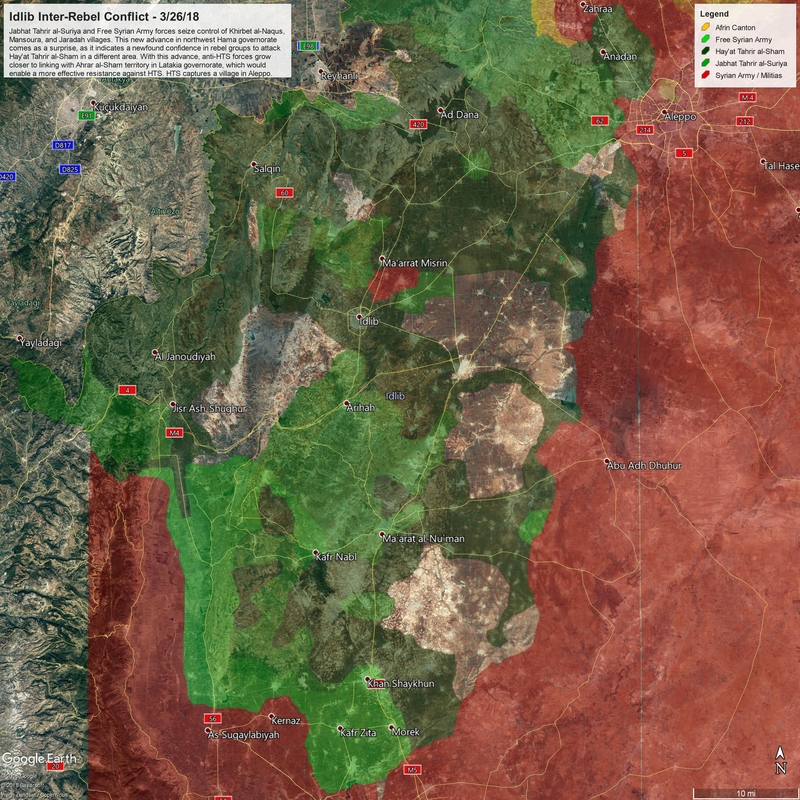 There has been a recent restart in confrontations between extremist and moderate rebel factions in Idlib governorate, partially due to the expiration of a ceasefire deal signed a few weeks ago. Jabhat Tahrir al-Suriya and Free Syrian Army forces seized control of the villages of Khirbet al-Naqus, Mansoura, and Jaradah. This new advance in northwest Hama governorate comes as a surprise, as it indicates a newfound confidence by rebel groups to attack Hay’at Tahrir al-Sham in a different, unexpected area. With this advance, anti-HTS forces have grown closer to linking with the pocket of Ahrar al-Sham territory in Latakia governorate, which would enable a more effective resistance against HTS. Whether this advance grows into a sustained rebel push towards Jisr al-Shugour remains to be seen. In addition, HTS captured a village in Aleppo to solidify its control in this region and improve its chances against any future battle with Harakat Nour al-Din al-Zenki and Faylaq al-Sham.